No other guide covers the complete retail picture like this exciting new volume. The global retail industry is in the midst of vast changes. Malls are being redesigned in the U.S., while new mall construction is booming in Asia. Savvy firms are combining bricks, clicks and catalogues into multi-channel retail powerhouses. Which are the hottest retailers? What lies ahead? Our market research shows you trends and a thorough analysis of technologies, chain stores, shopping centres, mergers, finances and future growth within the industry. Included are major statistical tables showing everything from retail sales by sector, to mall sales per square foot, to the advent of retail-based entertainment venues. Meanwhile, the corporate profiles section covers the Retail 500 Firms, giving you complete profiles of the leading, fastest growing retail chains around the world, both public and private. These profiles include corporate names, addresses, phone and fax numbers, web site addresses, growth plans, competitive advantage, financial histories and up to 27 executive contacts by title. 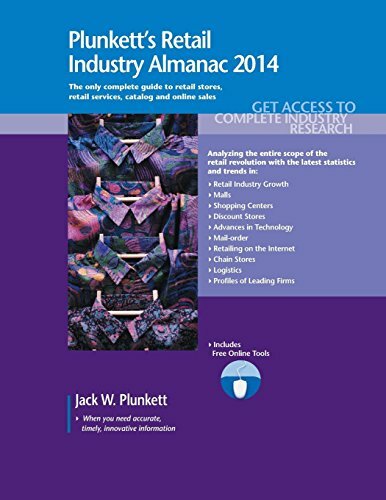 Purchasers will find a form in the book enabling them to register for 1-year, 1-seat online access to tools at Plunkett Research Online, including the ability to view the market research/industry trends section and industry statistics. You have access, at no additional charge, to the very latest data posted to Plunkett Research Online. Online tools enable you to search and view selected companies, and then export selected company contact data, including executive names. You'll find a complete overview, industry analysis and market research report in one superb, value-priced package.